Duration® Exterior Coating is formulated with PermaLastTM Technology and infused with advanced acrylic co-polymers for long-lasting performance. Duration has a high film build and provides a thick, flexible layer which results in excellent hide and protection from peeling and blistering. And Duration now has a longer open time to easily achieve a smooth appearance. 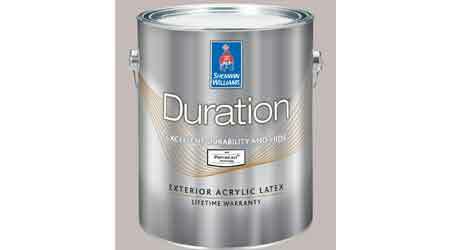 Duration is self-priming and provides a mildew- resistant coating. It requires just one coat for repaints and two coats for new work so exterior jobs get done fast. Combine that with premium durability, and you’ll benefit from a wealth of advantages — saving time and money, minimizing callbacks and repaints. • Formulated with PermaLast™ technology for more durability and a thicker coat than ordinary latex paints. • Excellent protection from cracking, peeling and blistering. • Flash rust resistance minimizes nail head rusting and its tannin bleed resistance is better than conventional latex paints. • Low temperature application down to 35 degrees. • Self-priming, using one coat for repaints and two coats for unpainted surfaces. • Available in flat, satin and gloss. • Contains VinylSafe® technology, allowing users to paint darker colors on vinyl siding without worrying about warping or buckling.